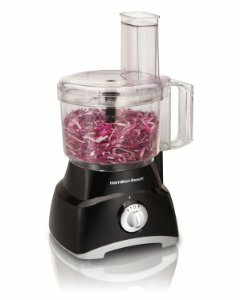 Home » Food Processors & Mixers » Food Processors » What is the Best Food Processor Under $100? If you’re only cooking for a small family or only make simple items but still need to hurry up your prep work, you won’t need to spend in the hundreds for a food processor to help you along. To know what is the best food processor under $100, we pore through the reviews of lots of options but only select the ones that can actually do a good job and won’t break down after just a few uses. A good processor for less can chop, slice, grate and mix ingredients easily even if making bread dough is rare. You may even be able to get a high-power motor so that you can make nut butters! It’s nice to have a big enough work bowl so that you can finish processing ingredients in a single batch, but if that’s not a concern for you, you can probably go even lower than your $100 budget. If you want to see what your options in food processors are today, Amazon has a range of inexpensive ones to choose from. This may be the best bang for the buck food processor on this list. The Hamilton Beach Chef Prep Food Processor has a powerful 500 watt motor and a 10 cup bowl that will be more than up to the task for grating, shredding, chopping and mixing. The extra Kugel disc allows you to do even finer grating too, while the large mouth of the feeder lets you get away with minimal prep work before using it. You’ll get two speeds with this processor, and a pulse function for even more versatility. Better still, this unit is dishwasher safe and the in-bowl blade storage makes them easy to put away when you are done using them. Its footprint is not the smallest, so make sure you have the space to store it. Customer service on all Hamilton Beach products has always been top-notch, and with this food processor it’s no exception. If you have a problem, need a part or have a question, give them a call and they’ll come through for you every time. This is the most expensive unit under 100 bucks, but it comes with features that the others just can’t touch. For starters, the 600 watt motor of the Cuisinart Pro Classic is capable of kneading bread dough, and don’t worry about break downs as the motor has a 5 year limited warranty to back it up. Besides kneading bread using the included plastic dough blade, this food processor will also slice, shred and chop with stainless steel discs and blades, and you can also get additional accessories and attachments that will make it an extremely versatile machine. It comes with a single speed with a pulse function. Keep in mind, however, that if you do make bread often and in medium to large quantities, it is best that you raise your budget and get a higher powered and heavier processor, like one of these that also come with dough blades. If you want to make nut butters, only do a cup at a time and let it rest every 5 minutes to avoid motor burnout. This unit also comes with an extra large feeding tube with pusher, so that you will be able to feed in many types of whole fruits and vegetables instead of cutting them up to fit. You also get a flat cover with a pluggable drizzle hole for when you’re making mayonnaise or salad dressing. The 7-cup bowl and accessories are dishwasher safe. If you want power in your food processor, the KitchenAid 9-Cup Food Processor boasts a 1000 watt motor that will tackle even the hardest chopping and slicing chores without working up a sweat. It comes with 2 speeds – low and high and a pulse function, and it is the most powerful unit on this list. You may wonder how you can get a high-powered Kitchenaid for such a low price and that is because it is a certified refurbished unit with a 6 month warranty. It comes with an innovation that makes it one of the easiest to use. You can actually turn a dial on the slicing blade to make the slices thicker or thinner, depending on your needs. There is a reversible shredding disk, an extra wide 3-in-1 feeder tube for minimal or no prep work, and it even comes with a mini bowl which is perfect for making such things as salsa, hummus or a single serving of salad. The bowls and accessories are all dishwasher safe. Storing all the accessories is not easy and they take up space because they won’t all fit in the bowl together and there is no storage case. Who says that you can’t get a decent food processor for less than 50 bucks? The Hamilton Beach 70740 Food Processor features a 450 watt motor and will slice, puree and shred with the best of them, just don’t expect this unit to do such heavy duty tasks as kneading bread or stiff cookie dough. But for basic food processing, grinding nuts and making pie crust, this unit is hard to beat. The 8-cup bowl is large enough for most tasks, and it comes with 3 speeds, which are labelled 1, 2 and “P” for pulse. The feeder tube mouth is fairly large, but you’ll still have to cut up larger fruits and vegetables to fit into the processor. The bowl and accessories are all dishwasher safe, and when finished, the cover inverts and all of the blades and disc fit inside for easy storage beneath a counter. Perhaps best of all, customer service is always one of the high points of any Hamilton Beach product, and this 8-cup Food Processor is no exception. Except for the Hamilton Beach model above, you’ll be hard pressed to find a full sized processor for less than $50, but if you only need one for processing small batches of food, the dandy Cuisinart Mini Prep Food Processor is a good appliance. The 3 cup bowl is more suited for chopping and grinding than actual food processing, and in fact, there are two speeds, one labeled “chop,” and one labeled “grind.” Nothing fancy here, just a decent little chopper that you might be inclined to use every day. This is one of the least powerful units here with only a 250 watt motor. Again, you won’t be able to use this processor for heavy duty tasks, but for chopping up ingredients when making salsa or hummus, you won’t go wrong. Of course the bowl and accessories are all dishwasher safe, so ease of clean-up will never be a problem, and this is a fairly compact unit, so you’ll always have adequate storage space in or under a cabinet, and the cord even tucks away in a compartment under the processor base. You can get this model in over 10 colors, so if you’re keen on buying matching appliances, this should be a definite consideration. The KitchenAid 3.5 Cup Food Chopper does exactly what it says. It chops food as good as any other processor, yet this is the least expensive unit on this list. With only 240 watts, it may seem not as powerful as the others, but again, this is a food chopper and not a food processor, so it is actually very powerful and competent for its size. You’ll get one chopping blade and 2 speeds: a “chop” speed and a “puree” speed. That makes this unit about as basic as it gets, but it will still chop and puree just like some of the more expensive units. There are a bevy of different colors to choose from, including majestic yellow, cranberry, crystal blue, tangerine and several others. All in all, this is one of the quietest choppers made, and it will take on peppers, garlic, carrots and anything else you can put inside of it. Plus, it even has a small feeder hole on the cover so that you can pour in liquids to make sauces or purees. ← What is the Best Burr Grinder for French Press or Drip Coffee?